February 28, 2017 - New Yorker Electronics is now distributing ceramic capacitors with the new C48X Dielectric Material from Exxelia Technologies (ex-Eurofarad). These high-power capacitors have very low heat dissipation, making them well-suited for aircraft, defense and space. The brand new C48X material combines most of the advantages of NPO and X7R dielectrics, enabling the new high power and high frequency ceramic capacitor range to provide great stability in high voltage. This eliminates the need to compromise between stability and capacitance. They also deliver high capacitance, great dissipation factor and fast charge/discharge. Compared to X7R material, C48X dielectric supplies the same capacitance values under working voltage with the unrivaled advantage of a very low dissipation factor (less than 5.10-4). It can also withstand very high dV/dt, up to 10kV/μs, which makes it the solution of choice for pulse and fast charge/discharge applications or firing units. Therefore, capacitors with C48X dielectric appear to be ideally suited for power applications where heat dissipation may be detrimental to performances and reliability. Driven by industry demands for miniaturization, Exxelia Technologies’ capacitors based on the C48X material have been developed from 200V to 5kV with chip sizes ranging from 1812 to 16080, allowing a maximum capacitance value of 10μF 200V (10 times more than with an NPO ceramic). 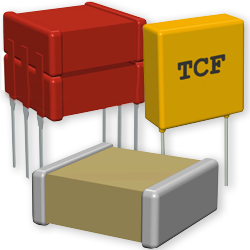 The standard stacked versions are proposed with a maximum capacitance value of 47μF 200V. Many mounting configurations are possible with either surface or through-hole mounting. All versions can be suitable for space use and can be designed in order to avoid any whisker growth risk (10% min lead in all tin-lead alloys used). The introduction of the C48X range in the EPPL (European Space Agency Preferred Parts List) for space is in progress for sizes 0603 to 6560 from 100V to 1kV up to size 1210 (and up to 5kV until the size 6560). New Yorker Electronics is a franchise distributor of Exxelia Eurofarad and carries its full line of Film, Mica, Tantalum, Aluminum Electrolytics and Ceramic Capacitors as well as its EMI/RFI Filters, Magnetics, Position Sensors, Slip Rings and Rotary Joints.